What is the level of transcriptional noise among genetically identical individuals? In Arabidopsis, more than 1,300 genes are particularly noisy – a trait associated with gene length, transcription factor binding and the chromatin environment. Differences in gene expression are strong determinants for phenotypic variability and are themselves affected by both the genotype and the local environment of a given organism. But even genetically identical organisms that exist in a homogeneous environment can exhibit variations in gene expression, often referred to as noise in this context1, 2. Such inter-individual differences have mainly been studied in unicellular organisms and cell culture, and this research has particularly taken off with the advance of single cell RNA-seq. However, while phenotypic variability has been widely described in multicellular organisms, plants in particular, data on gene expression noise in these organisms is scarce. Existing studies mostly focus on differences between single cells or tissues within the organism, but global studies of inter-individual variability in gene expression are virtually non-existent. With their preprint, Cortijo et al. have begun filling this gap, studying variability in gene expression among individual Arabidopsis thaliana plants over a 24-h time course. The authors employed RNA-seq to look at the transcriptomes of 14 individual seedlings per time point sampled every 2 hours during a full 24-h day/night cycle (Figure 1). They detected a wide-spread level of inter-individual variability in gene expression and identified more than 1,300 highly variable genes. Different subsets of these genes displayed different variability profiles, with the highest variability of two subsets being specifically observed at day and at night, respectively. This “noisy” set is enriched for genes involved in environmental and stress responses, whereas genes with low variability are mainly related to primary metabolism. Having established a comprehensive data set of gene expression variability in Arabidopsis, the authors then looked at the factors that may determine the level of variability. Notably, a correlation between expression level and variability was observed for fewer than half of all highly variable genes, implying that additional factors are involved in determining whether a gene exhibits noisy expression. Indeed, several genetic and epigenetic features were correlated with high variability: (1) highly variable genes are significantly shorter than their lowly variable counterparts; (2) their promoters are bound by a higher number of transcription factors; and (3) their chromatin environment is characterised by the presence of repressive epigenetic marks, while lowly variable genes are generally associated with permissive epigenetic marks. 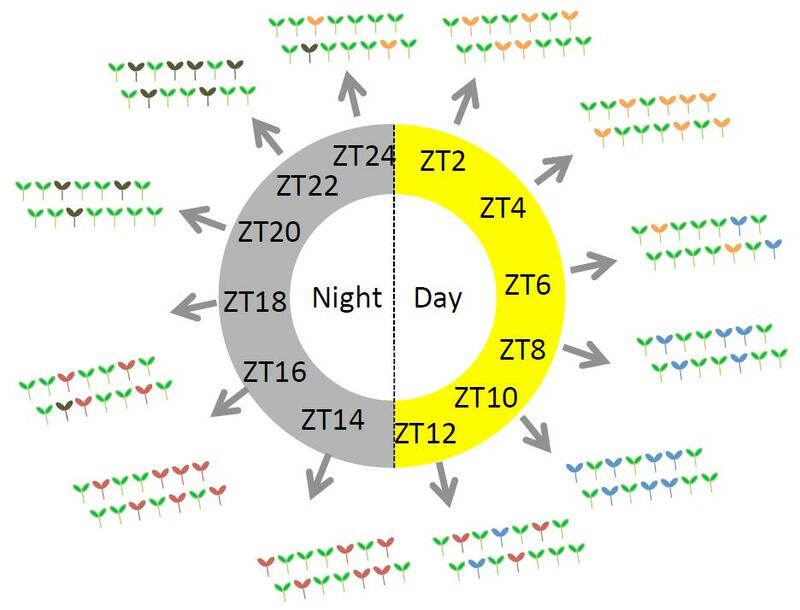 Figure 1: Experimental setup to identify transcriptional variability between seedlings during a 24-h day/night cycle. RNA-seq was performed on individual seedlings (12 time points, 14 seedlings each). Seedlings of different colours represent different transcriptional states, i.e. the inter-individual expression variability the study aimed to detect (reproduced from Cortijo et al., Fig. 1A). I particularly enjoyed that Cortijo et al. ventured into a field of research that is not heavily studied in plants or other multicellular organisms and thus largely lacks predefined concepts and methodology. While their approach itself is rather straightforward, the authors had to take many precautions to ensure their data are meaningful and not the result of either slight variations in experimental setup or technical noise in RNA preparation and sequencing. By doing so they have established ground rules for similar investigations and also provide a valuable resource future research can build upon. In addition, I like that the authors made their data readily available via an easy-to-use web interface. So if you have a favourite Arabidopsis gene and would like to know about its variability, make sure to check out https://jlgroup.shinyapps.io/AraNoisy. A gene’s length, chromatin environment and the number of transcription factors binding it are factors associated with its level of expression variability. However, these observations are just correlations and a causal relationship has yet to be confirmed. How will future research tackle this question? Can we identify a particular genetic background that exhibits perturbations in one of these factors, or can we extrinsically alter any of these factors to study effects on noise? As the authors themselves point out, it has been suggested for unicellular organisms that noisy gene expression is a survival strategy under unpredictable conditions; variability in the expression of stress genes for instance may increase the likelihood of some individuals to survive stress treatment. Intriguingly, many highly variable genes in Arabidopsis are involved in environmental and stress responses. Is there a way to show that noisy expression of these genes indeed benefits the survival of a plant population under certain circumstances? Raj, A, and van Oudenaarden, A (2008). Stochastic gene expression and its consequences. Cell 135(2): 216–226. Raser, JM, and O’Shea, EK (2005). Noise in Gene Expression: Origins, Consequences, and Control. Science 309(5743): 2010–2013.